A huge amount of silt can suffocate corals and ultimately kill coral reefs. Hence, it is necessary to monitor siltation to ensure that a coral reef can survive in the long-term. To monitor local coral ecosystems in Chaojing (潮境) of Keelung and Fanzaiao (番仔澳) of New Taipei, Taiwan Environmental Information Association (TEIA) coordinates Reef Check Taiwan annually. Last year, siltation was observed at various reefs and this process is still ongoing. Approximately, 5% of reefs in Chaojing are covered by silt. Volunteers also reported a thin layer of silt at Fanzaiao 10 meters under the sea surface (FZA 10m). The health of living corals coverage (i.e. 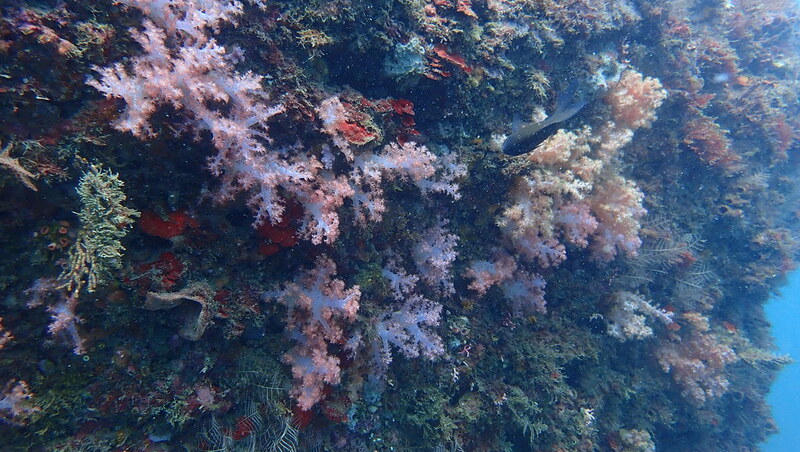 both soft and hard corals) range from “Poor” to “Average” across both sites. Specific indicator organisms such as fishes and invertebrates were also recorded. In this July and August, the TEIA worked with its volunteer scuba divers to conduct the Reef Check Taiwan in Chaojing and Fanzaiao. The volunteers reported that the total living corals coverage ranged from 21.9% to 35%. The lowest coverage was at Fanzaiao 5 meters under the sea surface (FZA 5m), with the highest at Chaojing 10 meters under the sea surface (CJ 10m). 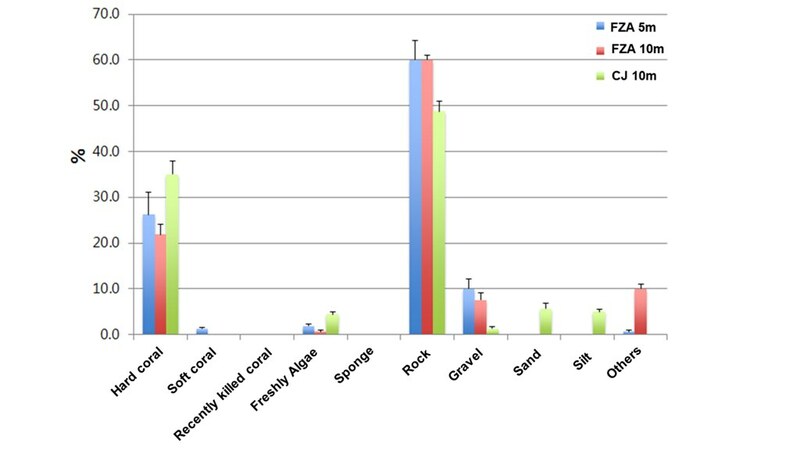 Living corals coverage at FZA 5m and CJ 10m are of average health (i.e., 25%-50%). Of particular interest was that 5% of the reefs at Chaojing were covered by silt. Also, further observations found that some corals at Chaojing were already covered by silt. While no silt was recorded at FZA 10m, volunteers had already observed a thin layer of silt forming. The grain size of silt is smaller than sand. Therefore, silt requires a longer time to be deposited once it has been disturbed. Suspended silt thus affects the visibility of seawater, and may also cover the surfaces of coral reefs. The corals are able to activate their self-protective mechanism when the amount of covering silt is small. However, when the amount exceeds their tolerance threshold, the corals will suffocate and die. In 2009, Taiwan Power Company (TaiPower) had originally planned to build a coal terminal in Fanzaiao and to retrofit the old coal power plant. This plan was canceled due to protests from local residents, elected representatives, and environmental groups. TaiPower then re-proposed “Alternatives for Shen Ao Retrofit & Expansion Feasibility Study” in 2015. 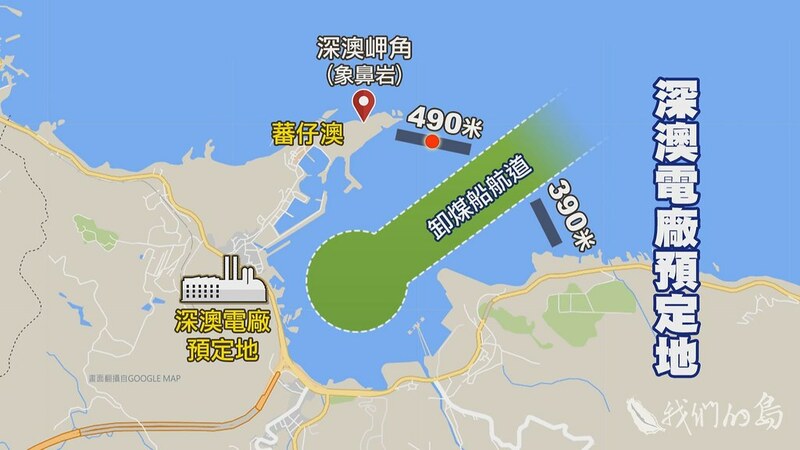 In this plan, TaiPower will build the coal terminal in a CPC Corporation Taiwan owned pier but breakwaters will be built next to Shenao Cape. This development could change local ocean surface currents, and dust and bare soils produced by the construction may indirectly affect surrounding ocean ecosystems. For indicator organisms for overfishing and aquarium fish collecting, both sites had recorded species such as butterflyfish (Chaetodon spp. ), grouper (Serranidae) and moray eel (Muraenidae). 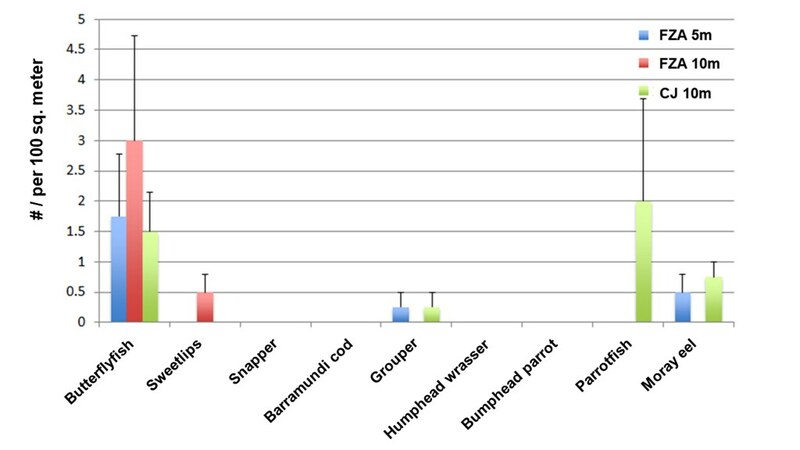 The population density of butterflyfish is 1.5-3 individuals per 100 m2 with the largest population at FZA 10m; the population density for moray eels ranged from 0-0.75 individuals per 100 m2 with the largest population at CJ 10m. 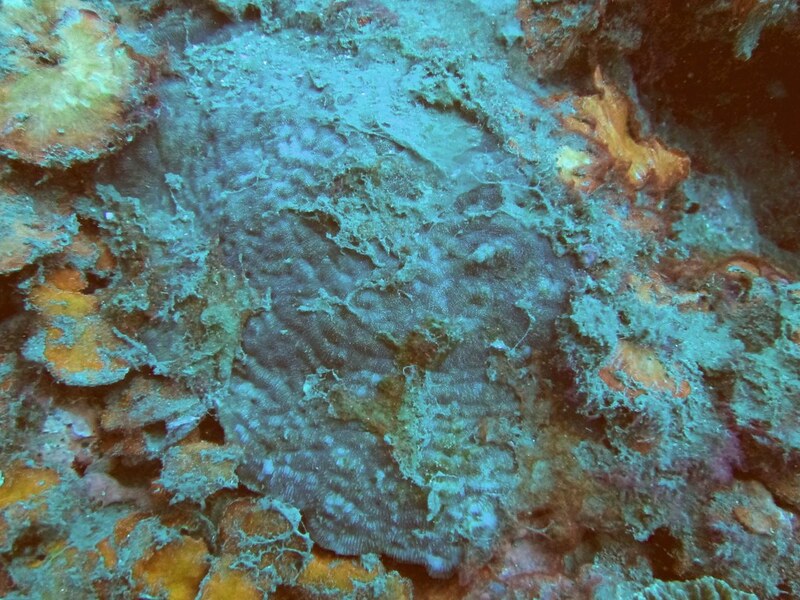 It was surprising to have observed groupers at both sites. Reef Check only records grouper that is larger than 30 cm, because large-sized groupers are rarely found in the ocean due to severe overfishing. Small amount of sweetlips (Haemulidae) and parrotfish (Scaridae) were observed on site. As for indicator organisms for overfishing, invertebrates such as the long-spined black sea urchin (Diadema spp. ), sea urchin (Hemicentrotus pulcherrimus), and lobsters were observed at both sites. Sea urchin and lobster are rarely spotted because of their high economic values. Additionally, banded coral shrimp (Stenopus hispidus) was spotted at CJ 10m. Based on the 2018 Reef Check Taiwan, the most effective outcome is achieved when an area is both conserved and a strict ban is enforced. Fanzaiao was declared as a part of Rueifang (瑞芳) conservation area by the New Taipei City Government in 2014. Hence fishing and collecting of coral reef species were regulated accordingly. Chaojing was declared as "Wanghaixiang’s Chao-Jing Bay Resource Conservation Area" (望海巷潮境海灣資源保育區) by the Keelung City Government in 2016. Therefore, no fishing activity was allowed beside the harvesting of edible seaweed. Note: The 2018 Reef Check Taiwan is organized by the Taiwan Environmental Information Association, co-organized by the Wild Bird Society of Taipei Guandu Nature Park, and sponsored by the HSBC Bank (Taiwan).